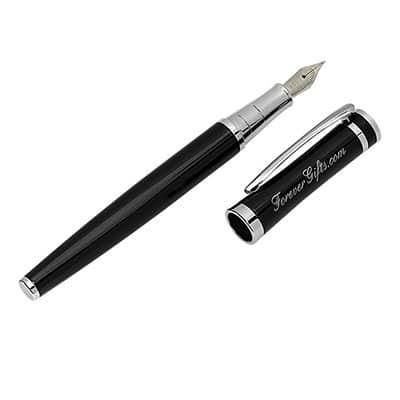 This high quality Black and Silver Fountain Pen is certain to impress that executive in your life this holiday season. The perfect office accessory or conversation starter, this sophisticated fountain pen is refillable and actually works! With a fashionable black and silver design, this unique pen is certain to impress almost anyone on your holiday shopping list this season. This elegant fountain pen includes two cartridges- one that is full and one that is refillable so your loved one can add his or her comments or signature with ease. Simply twist the tip of the pen counter clockwise, dip in into the special ink, and twist it clockwise to refill. Add a personal touch to this exquisite gift with FREE custom engraving that includes up to 30 characters of text in the font of your choice. This keepsake quality fountain pen measures 5 3/8 inches x ½ inch x ½ inch and includes the pen, 2 cartridges, and an elegant case for safe keeping.